Medifixit is a one stop solution for all types of medical services and aims to help patients around the world in searching, choosing and availing best medical care for their ailment. This platform has made the lives of many patients easier by saving the additional expenses incurred while trying to locate best medical services. It lists the top doctors in their respective fields, stores client medical history and also has associated healthcare services (pharmacy, labs etc.) listed to provide a complete medical solution for the patients. The easy and user friendly online service allows patients to register, book an appointment with a medical practitioner, choose a hospital and get timely and superior quality medical aid. 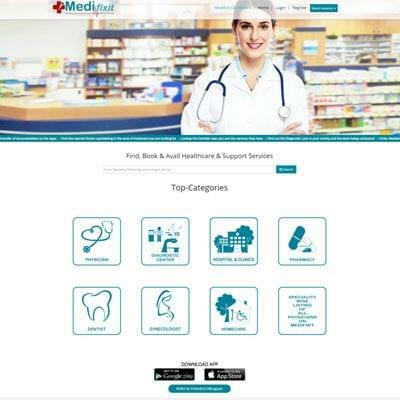 Medifixit is a beyond e-commerce solution aimed at helping patients in need.
" StoreHippo built exactly the type of site we wanted. The site is so simple that even the patients with bare minimum knowledge of computers can use it. The team has also been very helpful and has always given us easy solutions for any updated requirement. "